Several days ago I did not know what I wanted to cook, it was nearly weekend and we haven’t planned anything to prepare that day so what I have on my freezer are leftover ingredients. 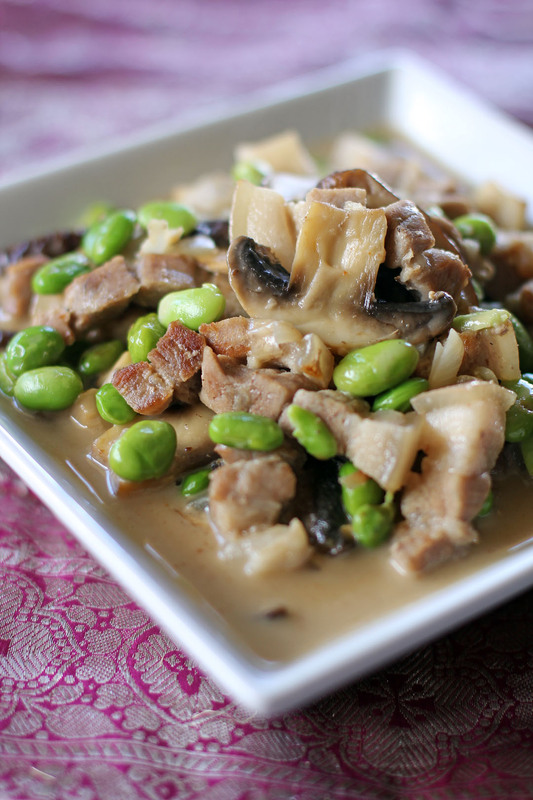 I was thinking of doing some free style cooking but when I do that it usually ends up in something stir fried, fried rice or a noodle dish, we will be changing that hence I made this coconut curry dish made out of pork, shiitake and edamame. In a pot add oil then brown pork pieces on all sides. Remove from pot then sauté garlic, ginger paste and shallots. Bring the pork back the pot then add two cups of coconut milk, bring it to a boil then simmer in medium heat for 20 minutes. Add the two cups of remaining coconut milk, mushroom, edamame and cayenne pepper. Bring to a light boil then continue to simmer for 5 more minutes. This sounds delicious and like something for everyone in my house. The mushrooms and pork sold me. The edamame and coconut would win over the kids. Have a great weekend Raymund! You always do the best things with pork belly and this is no exception. The coconut cream is the bomb! This dish is so uniquely delicious! Mushrooms and pork infused with coconut flavour! Can imagine how decadent it must taste! This sounds so great! I feel like a lot people I know shy away from cooking pork, so it’s nice to see this yummy post up. This looks like pretty delicious freestyle! What a rich and tasty looking dish! 3 cups coconut cream! I’m sold! 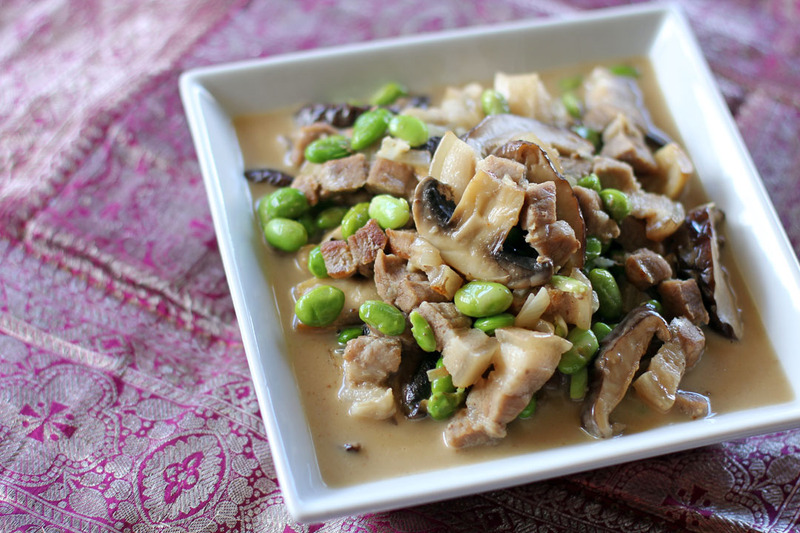 Pork, mushrooms, and coconut…Oh, please sign me in!!! This sounds amazing!!! I have found frozen edamame at my local supermarket and love to find news ways to include them in my diet – thanks !